We all dream of recreating delicious fondue worthy of a restaurant in the French Alps. Here's our guide to making the many varieties of cheese fondue. It's so easy, as long as you follow the right rules, use the right cheese and have the right equipment. 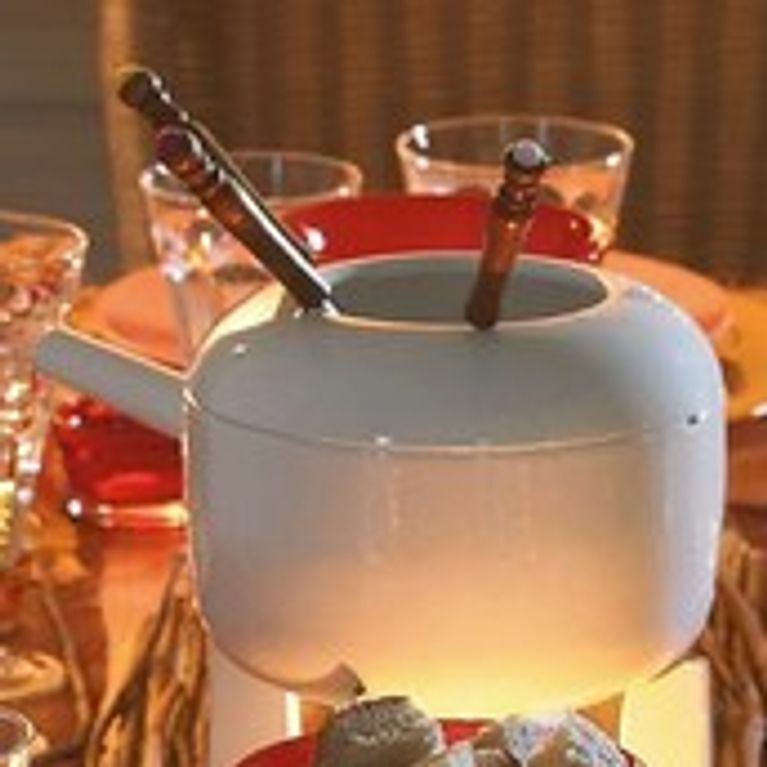 Start by rubbing a caquelon (fondue pot) with a clove of garlic. Heat the white wine with the cornflour. Add the chopped cheese and let it melt, constantly stirring in a figure of 8 with a wooden spoon. Once the mixture is even, gradually add a dash of kirsch and bicarbonate of soda. Add pepper and serve at a moderate heat. Note that certain cheeses harden quickly, especially hard cheeses... you need to cook these over a medium heat. On the other hand, some soft cheeses don’t stand up to heat very well, so choose your cheese and cook it accordingly. Your fondue should stay even, with a semi-liquid appearance, and shouldn’t form lumps when you dip the bread in. You can’t have fondue without bread, preferably hard bread. A couple of days before you plan on having your fondue, buy fresh bread (baguette is perfect) and leave it to go hard. Use a clove of garlic to rub your fondue pot with before adding the cheese. This adds flavour to your fondue. It might not seem like much, but it’s vital! This adds aroma and a bit of liquid to the mixture. Be careful not to put in too much though! Cornflour acts as a binding agent, making the fondue creamy and even. Bicarbonate of soda makes the fondue easier to digest. > If your fondue is too thick, add wine. > If your fondue is too runny, add a bit of cornflour + white wine. > If your fondue isn't creamy enough, add a bit of double cream, or cornflour watered down with a bit of wine. Make sure that you don’t scrape out the pot, even if it’s really tempting: what ‘s left at the bottom is very well-cooked fatty cheese which is basically a mission to digest!